Xherdan Shaqiri scored a sublime goal against Cardiff today, which eased the tension when the score was 2-1. The Swiss rushed into the box, left a defender for dead and rolled the ball into the corner of the net like it was the simplest thing in the world! We improved massively when he came on for Adam Lallana and his cameo might earn him a starting role against Arsenal next weekend. But even off the bench, Shaq’s been exceptional. Statistician Andrew Beasley shared this information following the match that effectively, the 27-year-old has either scored or assisted every 63 minutes. That’s not counting his beautiful pass that made Roberto Firmino’s goal v Red Star Belgrade, either! 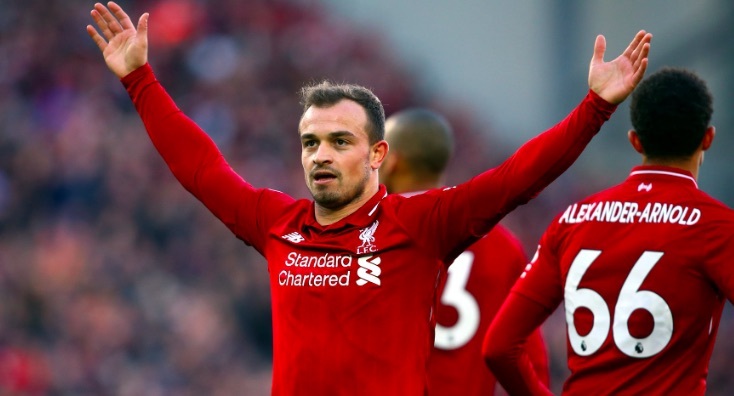 Shaqiri has a goal or assist every 95 minutes for Liverpool. If you count assisting the own goal and Salah's goal (via free-kick rebound) against Southampton, it's every 63 minutes. Not bad for a £13m signing, right? To put that into perspective, it’s about the same money we received for Danny Ward, so Leicester City could use him as their backup keeper. We may have spent big in the summer, but the current squad is packed full of incredible bargains.